The Hispanic Association of College and Universities will offer a free webinar for college students on “Gaining career experience with a HACU paid internship.” This webinar will take place on February 14, 2019, from 2:00 – 3:00 p.m. CST | Register here. If you’re a college student interested in securing a paid internship in 2019, submitting your application early is key. 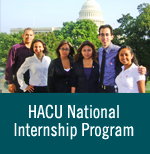 HACU has federal and corporate partners who are seeking college interns in the summer and fall.